1. Preheat the oven to 200°C, gas mark 6. Cut the cauliflower into chicken-wing sized pieces or florets. In a large bowl mix the tomato purée, oil, tamari, vinegar, smoked paprika, garlic granules, chilli powder and maple syrup (or sweetener) using a fork or whisk until smooth. Add the cauliflower to the marinade and mix well to coat. Set aside for 20-30 minutes. 2. Transfer the marinated ‘wings’ to a large baking tray – ensure the wings are not touching each other so they can crisp up on all sides. Bake in the oven for 20-25 minutes or until the edges start to go crispy. 3. Meanwhile, to make the mayo, bake the unpeeled, whole garlic cloves in the oven for 15 minutes, until soft – they will taste creamier and a lot more delicate once roasted. Set aside to cool, then peel the cloves and put them in a blender with all the other mayo ingredients, except the olive oil. Blend for 1 minute, then with the motor running, slowly trickle in the oil until the mixture emulsifies and comes together. Continue to blend on medium speed until creamy. 4. 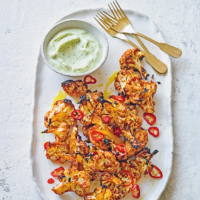 Put the hot ‘wings’ on a platter and scatter the sliced chilli over for a nice pop of colour. Serve with the mayo alongside for dipping. Cook’s tip Any leftover mayo will last 1-2 weeks in the fridge and tastes great on sandwiches and most other things!